Mrs. Rose Jenkins is nominated Teacher of the Year for PES. Mrs. Sandy Sutton is awarded the March ABC for staff. Miss Courtney Kane is awarded the March ABC for faculty. Ms. Logan Parker, PES 3rd grade teacher, is named ABC Faculty for February. 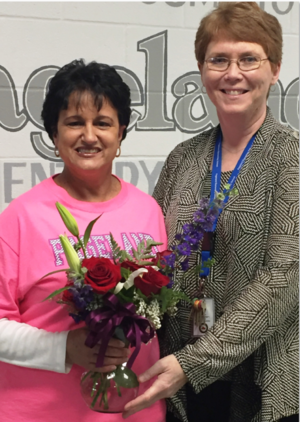 PES's secretary, Dana Sims, was the recipient of the February ABC staff award.